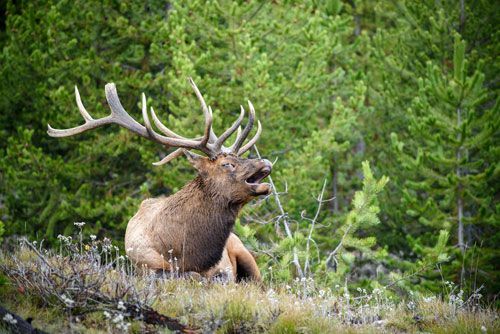 Hunters will find the Lazy R Campground to be the perfect base camp for stalking game in the Ranchester area, whether hunting elk in the Big Horn Mountains, whitetail deer in the foothills, or mule deer and antelope on the plains to the east. Our fully-appointed cabins include everything you need to enjoy a good meal and get a good night’s rest at the end of a long day of hunting. Save some money by roughing it only slightly in our efficiency cabin, or bring your RV and take advantage of our economical full-hookup rate. Sheridan County is home to some terrific public access walk-in areas. These hunting and fishing areas are identified with signs, and can be located by using maps found in an atlas, which is available at the Wyoming Game & Fish regional office and license agents. Private land hunting opportunities require landowner permission to hunt, fish or traverse through. For private land arrangements or for questions, contact the WGF Regional Office at 307-672-7418 or 1-800-331-9834.